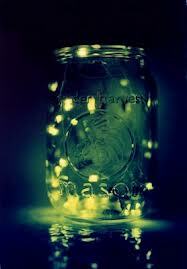 Remember when we were kids and we spent the late summer afternoons waiting for the darkness to come so we could catch fireflies in a Mason jar? Unlike other bugs that we were fearful of, we loved fireflies. We would punch holes in the top of the jar for air to make sure they could breathe. We liked them because they did not bite and because the tiny little bugs-in-a-jar lit up the jar becoming much like a flashlight to guide our way back home in the darkness. And so it is. There is darkness in our world. Children are hungry. Parents are struggling to manage their children and frankly children are struggling to manage their parents. Homeless people have no place to go when someone tells them their park-bench home is no longer for their use. People continue to be inflicted by cancer and other rare illnesses for which we have no cure. My goodness, there certainly is darkness! We did not choose these ugly things to happen, and we do not like them. Yet in that darkness are the fireflies—the tiny bits of light that show us the way home. We need to capture that light and offer it to others in need, to show the way home. In recent disasters, we saw neighbors housing other neighbors, and communities coming together as they had not done in the past. When I consider the 2008 recession and all the darkness regarding loss of jobs and homes, I remember how families came together to help one another, neighborhoods shared resources, and we simplified our lives as we focused on what really mattered. Leigh would say without these trying times we might miss the “fireflies”, the opportunities to be reminded of what is really important, the signs that we need to provide light for one another. I think we truly do know what is important and do not need national tragedies to be reminded, but I think we get wrapped up in the speed of life, and forget what life is really about. Perhaps our role throughout life, even before the darkness falls, is to provide bits of light to guide others who need help finding their way out of their darkness. Our decision to reach out and help provides strength to those who lack the strength to face the darkness alone. I do not have the answer to the question “Why?”, but when the darkness hits our country, my neighborhood, my family or a friend, I will think of the fireflies and provide them light so they can get out of the darkness.